While cultivation of grapes in Sicily dates back to 500 BC and the area produces more wine than even Tuscany, until quite recently most exported brands were considered by the majority of consumers as rustic quaffs –with too many oxidized whites and bitter, fruitless reds. Now, it seems like more than a few Sicilian bottlings are the latest, greatest oenophilic discoveries, with boutique producers galore – akin to the situation in the late 1970s in California. What’s accounted for this major upgrade in wine quality is a substantial philosophic shift by a growing number of producers away from an “easy money” mentality fostering mass quantities of characterless, high alcohol plonk- often made to be shipped outside the area to “fortify” other wines. This new brigade of vintners espouse a commitment to vintages that show the character of the soil, climate and winemaking skill. In general, these wines are from indigenous grapes like Nero d’Avola, Frappato and Zikbibbo, often blended with each other or more well-known varietals like Merlot, Cabernet Sauvignon and Chardonnay. And what they’re finding is that Italians and the rest of the world will pay a premium for such wines. This producer, located on a Mt. 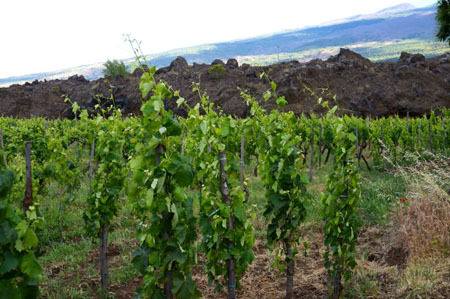 Etna hillside near the northeastern town of Randazzo produces two wines from grapes grown in a small vineyard miraculously spared from the wrath of 1 1981 volcanic eruption by a sudden turning of the lava flow. The Allegracore Etna Rosso ($23) is a blend of Nerello Mascalese and Nerello Cappucino fermented and aged in large stainless steel vats. The 2009 vintage shows a ruby hue and a fruity bouquet and taste with notes of herbs in the finish. And only in years when the grapes have a perfect balance of sugar and acidity and have fully extracted the mineral flavors from the volcanic soil, Vigo Etna Rosso is produced from a blend that contains at least 90 per cent Nerello Mascalese. The excellent 2008 vintage bottling ($40) has a deep garnet color, an intensely fruity bouquet of fresh picked raspberries and a complex taste of ripe fruit, exotic spices and earthy minerals, with a long memorable finish. Both wines pair well with pasta with red sauce, mushroom risotto and dishes containing eggplant, like the Sicilian favorite, Pasta Norma. Founded in a garage by three friends in the late 1970’s, this winery near the southwestern town of Vittoria produces a range of wines, all made organically, biodynamically, and using sustainable techniques. Their flagship product is Cerasouola di Vittoria – a blend of 60 per cent Nero d'Avola and 40 per cent Frappato. The 2010 vintage ($28) vintage has a ruby red color, a fresh floral bouquet and a rich taste of fruit and herbs with a touch of tannin in the finish. This wine mates well with grilled tuna and swordfish as well as with game birds and blue-veined cheeses. Moreover, based on a tasting of this wine from the 1981, 1990, 2000 and 2008 vintages, the 2010 can be expected to drink well now and over the next 30 years, with a complex flavor of violets and berries more pronounced in the older wines. Another COS wine of note is a berry-scented, elegant 2005 Syre Nero d'Avola ($35) that has a long, smooth, memorable finish, perfect to accompany osso bucco and veal chops. 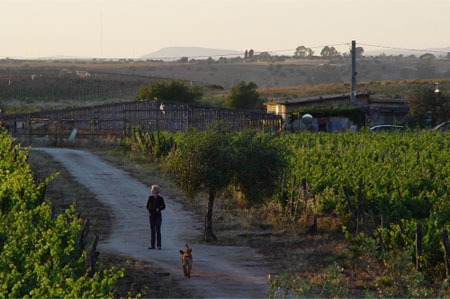 Originally a producer of Marsala, the Rallo family who own this winery (located in the Northwestern town of Marsala) sold off that business in the early 1980’s to produce only premium wines with a focus of sustainable agricultural techniques. The 2007 Mille une Note (90% Nero d’Avola) ($60 is exceptional – with fruity flavors reminiscent of a Premier Crus red Burgundy that marry well with veal, chicken and fresh goat cheese. For less demanding palates there’s a 2008 Tancredi (a blend of predominatly Nero d’Avola and Cabernet Sauvignon, with smaller amounts of Tannat and other varietals) ($32) with a bouquet and taste of berries and cassis. The 2010 Lighea ($14) is a newly developed wine form the Zibibbo varietal and shows a pale straw color, a perfumed bouquet and taste of ripe peaches and figs, with a crisp finish that makes excellent accompaniment to a wide range of hors d’ouevres and mild cheeses. And, for fans of sweet dessert wine there’s a rich 2009 Ben Rye Passito (100% Moscato di Pantellenia) ($42/375 ml) that has honeyed flavors of orange blossoms and melons with a touch of lively acidity in the finish. 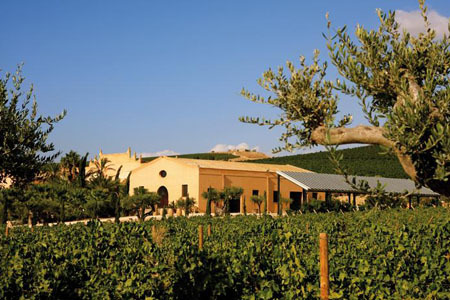 Ownership of a number of vineyards scattered throughout Sicily has allowed this family-run company to determine which soils and climates yield the best grapes. The results of over 40 years of such experimentation has led to production of a wide range of premium wines from both indigenous and non-native varietals. 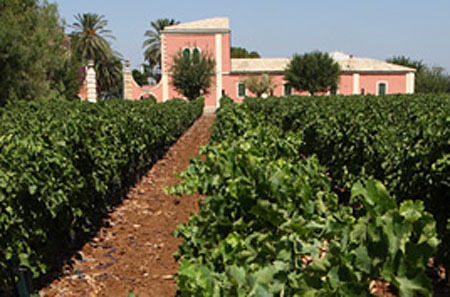 In fact, many other producers feel that it is the work of this company’s consistent production of top quality wines at reasonable prices and their determined marketing effort that has been instrumental in the heightened reputation for Sicilian wines. Some notable examples include: the 2012 La Segreta Bianco (a blend of Grecanico, Chardonnay, Viognier and Fiano varietals ($14), that has a pale yellow color and a taste of lemons and melons with a hint of vanilla in the finish; the highly acclaimed 2008 Santa Cecilia (100% Nero d’Avola) ($25), that shows a fruity bouquet and taste of ripe plums and raspberries; the sweet, delicate Passito di Notto (100% Moscato Passito di Pantellenia) ($30/500 ml); and a 2010 Chardonnay (100% Chardonnay) ($32) that has elegant flavors of toasty oak, vanilla and pineapple, with a touch of grapefruit in the finish – perfect with grilled salmon, shrimp and calamari. 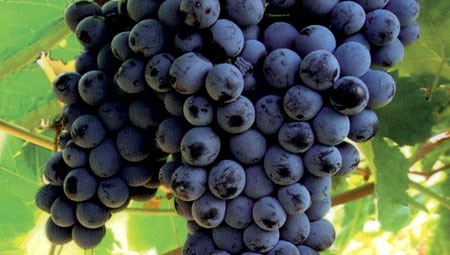 Azienda Agricola Occhipinti- especially for Frappato and Nero d’Avola. Azienda Agricola Gulfi- especially for Cerasuolo di Vittoria and Nero d’Avola. Tenuta Delle Terre Nere- especially for Etna Rosso and Etna Bianco. Tenuta di Fessina - especially for Erse Etna Rosso. Feudo Montoni- especially for Nero d’Avola and Colle del Mandorlo. Cusumano- especially for Nero d’Avola and Insolia.